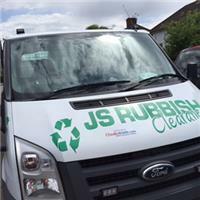 JS Rubbish Clearance - Garden Services, Rubbish/Waste/Clearance based in North Mymms, Hertfordshire. WELCOME TO JS RUBBISH CLEARANCE, WE SPECIALISE IN DOMESTIC AND COMMERCIAL WASTE, GARDENING AND FENCING. I HAVE BEEN ESTABLISHED FOR OVER 20 YEARS AND YOUR RUBBISH IS MY BUSINESS, THANKS FOR READING.